Kanha Shyam Residency is one of the popular residential projects that is located in Indira Nagar, Kanpur. This project, developed by Shyam Constructions, offers 2BHK and 3BHK apartments with basic amenities for the comfort of residents. It is close to market and many educational institutions. What is the location of Kanha Shyam Residency?The location of the project is Indira Nagar, Kanpur. What is available flat size in Kanha Shyam Residency? Flat sizes in the project range from 1154.0 sqft to 1674.0 sqft. What is size of 2 bhk in Kanha Shyam Residency? The area of 2 BHK apartments ranges from 1154.0 sqft to 1383.0 sqft. What is the 3 bedroom size in Kanha Shyam Residency? The area of 3BHK units in the project varies from 1548.0 sqft to 1674.0 sqft. What is total size of Kanha Shyam Residency?The project is built over an area of 4.0 Acres. What is the price of 2 bhk in Kanha Shyam Residency? 2 BHK units in the project are available at a price tag of Rs. 4850000. 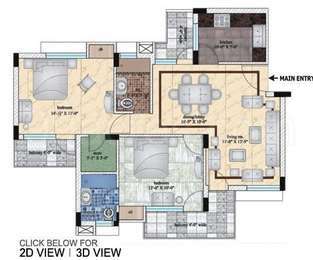 Hi, I am interested in a 3 BHK apartment in Kanha Shyam... Do you have any flat available for sale? Hi Saurabh, Kanha Shyam residency is a ready project and there are units available for sale and the resale price for units here starts with RS 49 lakh. You may contact a local property consultant to know the exact availability status of apartments.